This week’s Sea-Floor Sunday image is another regional view and another image highlighting plate tectonic features. I created using GeoMapApp (it’s super easy, try it!). This image is of the Scotia Sea, which separates the southern tip of South America from the northern tip of the Antarctic Peninsula. Note that I rotated the image such that north is to the left. As you might tell by looking at the bathymetry, this is a pretty complicated area tectonically. There’s subduction occurring at the top of the image and east-west oriented strike-slip movement along the prominent submarine ridges (some of which pop out as islands). 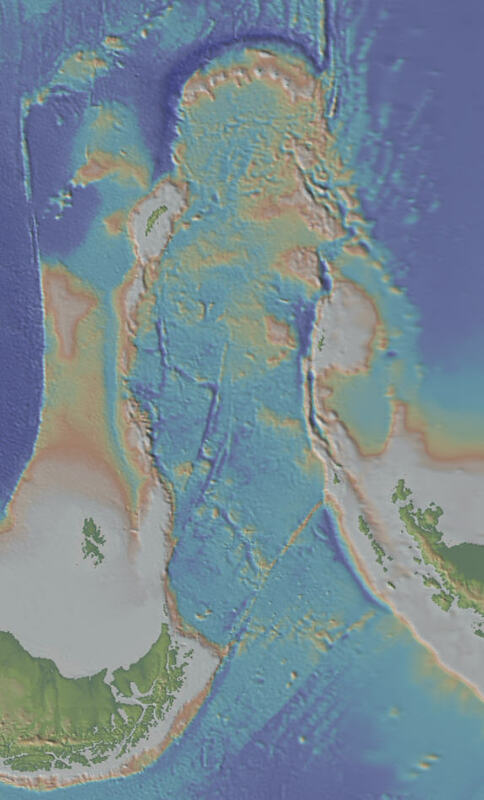 The Sandwich Plate is separated from the Scotia Plate by an area of sea-floor spreading that is not immediately apparent on the bathymetry. The map below shows the seismicity of the same area (from this USGS site) and is useful to compare with the bathymetry. Note the tiny Sandwich Plate behind the seismically active subduction zone at the top of the image. 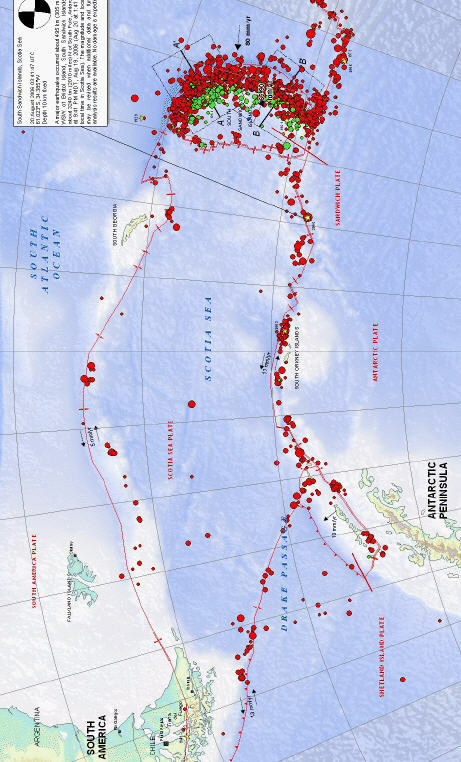 The relative strike-slip movement of the South American and Antarctic plates has created the two major transform fault zones that define the Scotia Plate. Note the eastward “bending” of the tips of South America and Antarctic Peninsula. In a very superficial way, this geometry is similar to the Caribbean Plate caught between the North and South American plates — a strike-slip-bounded “tongue” with a subduction zone at the tip of the tongue.